Beyond the Black Rainbow. 2010. Directed & Written by Panos Cosmatos. Starring Michael Rogers, Eva Allan, and Scott Hylands. Magnet Releasing. Rated R. 110 minutes. ★★★ (Blu ray release) You can be sure, whether you enjoy it or outright hate it, Beyond the Black Rainbow is unlike most of the films you’re going to see – science fiction and otherwise. Panos Cosmatos, son of director George P. Cosmatos (directed a couple movies I enjoy including Leviathan & Of Unknown Origin), brings us a terrifying vision of the 1980’s. Started in the 1960’s by Dr. Mercurio Arboria (Hylands), the Arboria Institute helps people achieve “true happiness” and aims to link science with spirituality. In 1983, the facility is run by an odd man named Dr. Barry Nyle (Rogers). Nyle also keeps a young girl named Elena (Allan) under heavy sedation in the complex where she has developed very strong, often lethal, mental powers. Only a strange prism-like structure is able to keep her at bay. Nyle conducts strange experiments on Elena, who seems to be suffering in this place. Eventually, Elena starts to come out of the fog she is being kept under medically, and tries her best to escape the Arboria Institute. I won’t say anything else further about the plot. You should go in knowing only the premise, or even less – go in knowing nothing at all. This movie’s plot is small, but the story surrounding it is massive. I really love this film for a lot of reasons. One particular reason is Cosmatos has crafted this really big story – it’s definitely one of the best science fiction films to come out of any country in the last decade. Hands down, I can say that. It’s a slowly paced film, however, the story will absolutely keep you engaged if you sit back and let it take you for a ride. Much of this film is visually fascinating. Even the simple scenes at the beginning between Dr. Nyle and Elena, each of them sitting opposite the other, separated by glass, and conducting therapy sessions. It could have been shot much more simple than Cosmatos opted to shoot. Instead, we’re given this visual feast of imagery from a red tinted view of Nyle often fading in and out, to the blurred and faded shots of Elena which ooze a sense of isolation. There are many different themes at play here. One of the main things I believe Beyond the Black Rainbow is looking at are the sort of ideals in the 1970’s & 1980’s, how things sort of changed all of a sudden, but also how the ones who claim they are there to help us are in fact enslaving us in a sense— they’re trapping us, putting us behind glass, monitoring and prodding us, just as Dr. Nyle does to Elena. I mean, you don’t have to read so far into this – on its own, the film stands as an amazing science fiction masterpiece, as far as I’m concerned. But just as any masterpiece can be dissected and look at in different lights, regardless of artistic intent, Beyond the Black Rainbow has a lot of bits and pieces within it which are easily paralleled with social and political themes. One of the bits on the back of the Blu ray release says this movie is a “Reagan-era fever dream”, and it truly is – there are a lot of comments in here about psychology, medicine, the modern uses of medication, and also the hypocrisy of governments & their usually militant stance on drugs (both prescription and street) while most of them are popping anti-depressants and viagra, et cetera, like it’s going out of style. I could go on and on about my own interpretations. Beyond the Black Rainbow works most, and above all, as a visually stimulating science fiction odyssey. You don’t need to dig in too deep to actually enjoy it. And if you do dig in, it’s really about what you take from the film. I don’t necessarily believe Cosmatos made this with the intention of making a statement – it’s more like he put it together from numerous influences on him from his youth. It really does feel like a dream. I can almost picture Cosmatos waking up in the middle of the night and jotting down notes, which would later become this movie, because there are so many scenes and individual shots that feel as if they were pulled directly out of the dreams in somebody’s head. It’s amazing. There are few films with those dream-like qualities. One of the only ones I can automatically think of easily is Andrei Tarkovsky’s Solyaris, which also has a heavy and beautiful dream feel to most of the film. Another really noteworthy aspect of this movie is its score – absolutely unbelievable. There are lots of filmmakers now jumping on the trendy bandwagon of having a retro type electronic score in their film. Not saying it’s a bad thing. I like these types of scores. Beyond the Black Rainbow is one of the films doing this which really pulls it off. There are some amazing bits in the score. One of those films where I can sit and listen just to the score by itself. I always love a film that has a score like that, adds another level to the film making when used properly. Another reason this movie pulls off its use of the music so well is because it isn’t just solely score as in music underneath some of the scenes. There are also really great uses of sound design here. For instance, there’s a swelling kind of deep electronic ring that happens throughout several of the scenes – particularly, when Dr. Nyle is conducting his sessions with Elena. It reminds me a little of some of the sounds in Stanley Kubrick’s The Shining, honestly. Not the same identical sound or anything, but something similar about their feel. This sound design really helps to set a mood and tone, along with the great atmosphere Cosmatos cultivates with the camerawork, visual effects, and incredibly small yet intricate set pieces. The ending divides a lot of people. What it says, to me, is the mind’s fragile in many ways. One in particular being the fact we have such important material in our brains, such power (especially when you consider both Nyle & Elena’s powers) inside, and yet all that protects it is a bit of bone and some layers of skin— a simple whack in the head can undo all that power. Also, I see the ending as a way of signifying a change from the psychological perspectives of happiness the Arboria Institute represents (a snapshot of particular aspects during the 70s you could say). Without saying too much, I see it that way not only because of the ending, but also due to the presence of the metal heads drinking and rocking out – this is a literal switch from all the electronic-psychedelic sounds we’ve heard the entire film. It’s almost a literal shift from the psychedelic to heavy metal, in the sense that times have changed. A new era has begun. And with that also comes the ending – I can only say ‘ending’ because if I say anything else I’ll probably venture into spoiling things. Just keep an open mind when the end comes. It isn’t some cop out – there is method to Cosmatos’ madness. A few of the effects in particular are really incredible in this film. One of my absolute favourite parts of the whole thing is when Cosmatos goes back in time a little, to sort of give us a bit of back story on the eerie Dr. Nyle. Everything switches from the colour schemes we’ve been seeing so far, and turns to black and white. I really love it because there’s such a trippy effect to the scene while only using the contrasts of black and white. While there are tons of other amazingly effective special effects throughout Beyond the Black Rainbow (everything: the glowing prism, the cosmonauts, even Barry Nyle’s transformed look near the end), I really loved this scene. It had an incredible aesthetic look and feel while also being very creepy, and giving us some exposition on the character of Nyle without going overboard. Great and crucial part of the film. There’s a really strong influence of Ken Russell’s Altered States on certain aspects of this sequence, especially the parts preceding the black and white imagery when it begins. Very cool, as there are many influences on Cosmatos clearly visible throughout the whole of the film. I remember hearing about Beyond the Black Rainbow quite a while before it was ever finished production. Something about the still photos they released and the description of the plot really just struck a chord with me. A lot of the early reviews then started indicating it was a very slowburn type of film, which (again when done correctly) is one of my favourite types. So the intrigue was there. I’m always leery of a film if I’m too intrigued, only because I’m afraid I’ll set myself up to be disappointed (recently I thought The Babadook might be all hype – I was excellently wrong). 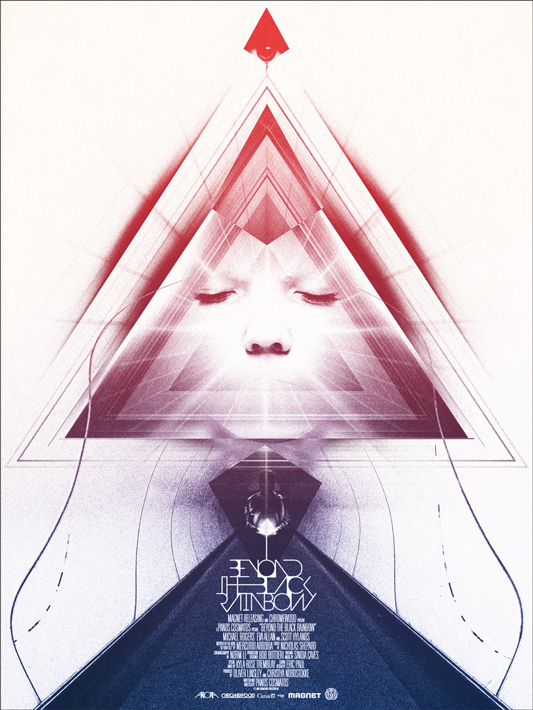 Once I finally got to see Beyond the Black Rainbow, I was blown away. In so many senses. It’s an incredibly beautiful looking film, however, it isn’t all flash. There is a lot of substance. Plus, it boasts a killer soundtrack, and a couple nice, creepy performances (most of all Michael Rogers as Dr. Barry Nyle – a terrifyingly daring performance) to really make this a must-see science fiction experience. Even if you don’t dig it totally, at least see it and give it a chance – not the same old science fiction trash you see so often being pumped into theatres everywhere. A flawless 5 stars for this beauty of a film. The Blu ray is really gorgeous in terms of picture. Also, the sound’s bonkers. I love every second. No special features except for one deleted special effect, which granted was very cool. On the whole, the release isn’t great. This is a low budget film and Cosmatos had to get creative in order to film certain scenes, so I imagine there wasn’t a lot of extra filming going on. I can forgive them, at this juncture, for not including many extras. That being said, I can only really give it 3 out of 5 stars— but it’s a whopping 3 out of 5. The picture and sound are worth the price of purchase, and you would not be disappointed. Get this if you can, watch it, and I hope some people will get a thrill out of it just like me. It’s really a work of art, and one of the greatest sci-fi movies to come out in the last ten years or more.